Boy track and field athletes: Please hand in your uniforms this Thursday, 5-28, at 2:30PM in the boy’s locker room. If you are not available at this time, please find Coach Foxen anytime in the morning on Friday 5-29 in Room 11-033 to hand in your uniform. Boys Basketball Players: Current 9-11th grade players interested in playing boys basketball next year, there will be a very brief, but mandatory boys basketball meeting tomorrow, Thursday, in room AA14 at 11:50. It is important that all attend. AP Statistics students for next year: Please stop by Mrs. Hirschfeld’s room AA38 to pick up a summer assignment this week. AP Physics students for next year: Please see Mrs. Joslyn (Room 132) Wednesday – Friday of this week for summer homework. AP Language students for next year: There will be a meeting in Mrs. France’s room (21-026) on Wednesday and Thursday after finals for students going into AP Language. Please attend one of the meetings to receive your summer homework. Girls Cross Country – There will be a Cross Country Meeting for Girls interested in running the upcoming 2015 season from 6:00-6:30 Thursday, May 28 in the cafeteria. Parents are encouraged to attend. Please see Coach Armstrong if you are unable to attend. The Muskie Library will again have extended hours for finals week! During finals week (Tuesday 05/26 – Thursday 05/28) the library will be open from 7:30am – 7:00pm. Students are encouraged to come use the extra study time to prepare for semester tests or final projects – snacks (brain food) will be served from 5:00-7:00pm. Good Luck, Muskie Nation! Any students in a Social Studies AP class for next year should attend a meeting on Wednesday, May 27, in the auditorium @ 2:45 to receive summer information. Teachers will be available at this meeting. Students – please make certain that PE lockers are emptied by 10:30 A.M. on Friday, May 29. Any items left after this time will be donated to Goodwill. Food Service will not be serving lunch on Friday, May 29. Muscatine High School Bands and Band Boosters present their fourth annual Drum Corps competition, ”Percussion on the Pearl,” on Sunday night, July 12, at 6 p.m., at the MHS stadium. Eight drum corps – from Wisconsin, Texas, New Jersey, Michigan, Tennessee, and Iowa – will compete, with the goal to make it into the lineup of competitors in the World Championship held in Indianapolis in early August. We are very proud to announce that two MHS band members, Luke LeBeau and Teddy VanWinkle, are members of the Colt Cadets who are headquartered in Dubuque, Iowa. Tickets range from $20-25 and will be available at the gate. For more information, go to www.muskiebands.org or call Janet Clark at 563-299-0019. Production Worker positions open at Heinz – please view the attached flier for more information. Summer Lifeguards – If interested in being a lifeguard, Geneva Country Club is hiring. Please stop in and pick up an application. Please remember that Muscatine High School sport schedules can be found at http://www.muscatine.k12.ia.us/mhs/calendar Our web calendar of events (linked to Google Maps) offers the most current updates and driving directions for all MHS athletic events! Be sure to check it out! Good luck to all the teams competing during the spring season! College 4 Kids – If you love hands-on classes and would like to help younger children, this is the opportunity for you! College 4 Kids is in need of volunteers June 15-June 26 at West Middle School from 8:00AM-12:00 Noon. 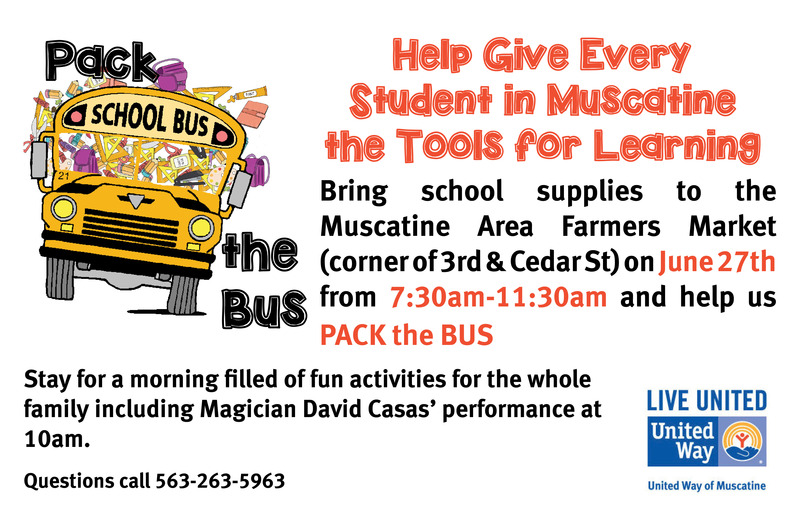 Please contact Laurie Schroeder @ 263-0411 or lschroed@muscatine.k12.ia.us. Deadline to apply is May 22, 2015. 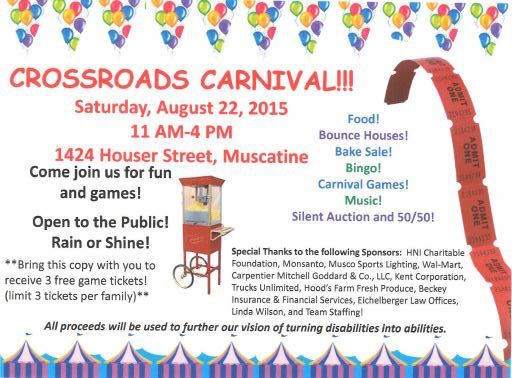 CROSSROADS is in need of volunteers to help with the games at the 2nd annual CROSSROADS Carnival. It will be held on Saturday, August 22, 2015 from 11am-4pm. You can stay for the whole day, or work in half day shifts. Shifts are 10:45-1:30 and 1:15-4. Lunch will be provided for volunteers that stay for the whole day. Please contact Shannon Walsh @ www.crossroadsmuscatine.org or at 563.263.3545 x. 101 if interested. Please view the attached flyer for more information. United Way is working on keeping the summer free lunch program, but we need your help. 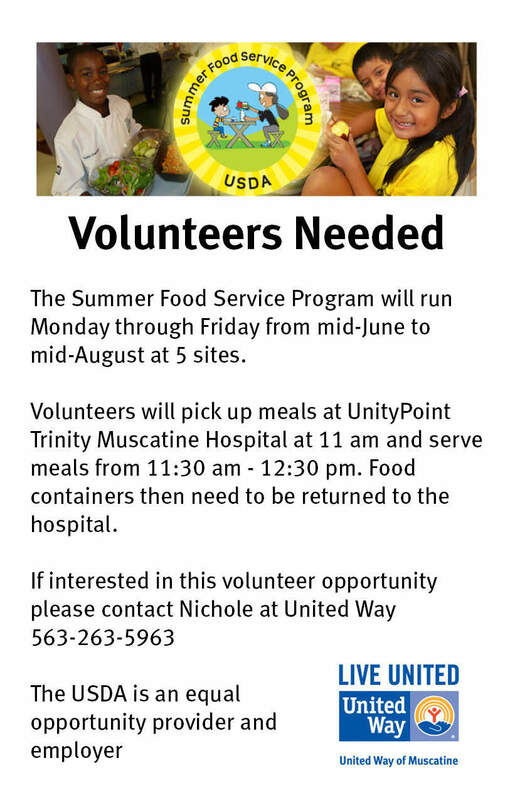 We are needing volunteers to help us deliver and serve meals during the summer. You can help 2 times or 10 times this summer. We just want your help. Please view the attached flyer for more information. 2nd Annual Pack the Bus Event. We are looking for groups to have a booth and have kid activities or if you are interested in just helping us, let me know. Please view ‘Pack the Bus Sign Up” link and attached flyer for more information.